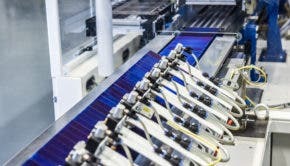 While nearly half of companies expect climate change to impact their value chain in the next five years, only a quarter of companies are actually taking action to adapt or increase their resiliency to the effects of increasing climate change, according to a new survey from DNV GL. Which Climate Change Related Hazards Will Have The Biggest Direct or Indirect Impact to your Organization? The survey revealed that nearly 98% of companies expect at least one climate change-related threat will have a direct or indirect impact on their business, with temperature increases and heatwaves (55%), storms (44%), and floods (38%) being companies’ greatest concerns. Only 1 in 8 companies responded saying that climate change impacts on their companies were expected to be more than 10 years away (i.e., they all expected it to be less than 10 years) but, despite increasing awareness and concern over climate change impacts, only 1 in 4 companies (and 40% of large companies) said that they are already implementing adaptation or resilience measures. “This is a small percentage compared to the threats they are facing,” explained Luca Crisciotti. The survey revealed that laws and regulations (50%) and needs/requests from customers (43%) are the primary drivers for taking action to increase adaptation and resilience to climate change. Safeguarding the company, public concerns/corporate responsibility, and business continuity fall closely behind. However, there are four main barriers to climate change adaptation according to the survey’s respondents: the costs of implementing adaptation measures leads with 36%, followed by Lack of awareness (35%), Climate change considered to have limited impact (34%), and Lack of long-term focus (33%). DNV GL also ranked 161 companies into a category they define as LEADERS — “a subgroup of companies that constitute frontrunners with regard to adaptation and resilience.” Companies were classified as LEADERS if they are already taking actions to adapt and increase their resilience to climate change. To the LEADERS, business continuity (55%) is just as important as laws and regulations (53%) when it comes to motivating their actions on climate change, and two-fifths of LEADERS (as well as large companies) believe that competitive advantage will spring from such actions.